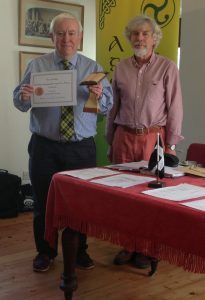 Prior to our Annual General Meeting held on 18th February at Murdoch House, Redruth there was a presentation of the literary award Pewas Perghyryn. This year it was awarded posthumously to Eddie Climo for his translation of Rip Van Winkle. The picture shows Eddie’s brother Laurie receiving the prize. The newly elected officers of Agan Tavas are: Clive Baker – Chairman, Ray Chubb – Secretary, Matt Blewett – Trasurer.